The original Blade Runner stands as my personal favorite film, and 35 years after the fact it gets a sequel. What did I think of it? My feelings are mixed on it, actually. Let's get out of the way first that visually, this film is a marvel and will be the best looking film that you will see all year. Whether it be through the costumes, set design, lighting, color, or the compositions, 2049 is every bit as gorgeous and stunning as it's predecessor ever was. The film succeeds spectacularly in creating a true extension of the visuals and style set forth by the original. Not unlike the first Blade Runner, the special effects work is excellent, especially those involving holograms and CGI work. I normally despise the plasticy look that CGI tends to result in, but in 2049 it is used effectively and masterfully. It is never meant to carry the entire visual load or result in an unnatural appearance, but rather compliments and supports what is already in frame. Some of the best scenes in the film make remarkable use out of this technology and they will inspire countless generations of filmmakers to come. Hans Zimmer's score for the film recreates the Vangelis sound almost identically. So similar is it, that it could very well be considered a cover of Vangelis. This creates a problem in and of itself, as not only does it create too much of a comparison with the 1982 Blade Runner but also reminds the audience that there are no truly powerful tracks in this film along the lines of "Memories of Green", "Blade Runner Blues", or the saxophone driven love theme. The performances in the film are serviceable for the most part. Nobody sinks the film or leaves it unbalanced, but there aren't any true standouts. Gosling does well as a burnt out cop driven towards solving his case and the secret to his identity. He is effectively intense in a low key way, but can occasionally hit a dry spell where he looks blank. Going from Drive to Only God Forgives every other scene so to speak. He is utilized best when interacting with his holographic love interest, where the films themes of disconnect, loneliness, tragedy, and longing come to fruition. 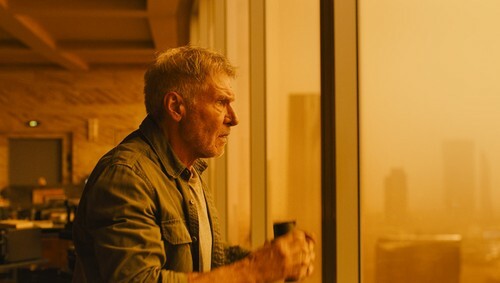 Harrison Ford gives the films best performance as an even more grizzled and traumatized Rick Deckard. He can come off as too grumbly sounding in the way that most recent Harrison Ford performances tend to be, but here it is consistent with the character's personality and isn't that big of a deal. The only thing that bothered the hell out of me was his t-shirt and jeans. Where was that classy 40's look that we miss so much? Out of the new characters, the best work belonged to Lennie James, Carla Juri, and Dave Bautista in solid but underwritten roles. Ana de Armas brings the best individual moments (especially in a fiercely original love scene) but doesn't have a character beyond being a morality pet for Gosling. Jared Leto is good (and thank hell, doesn't overdo the character as much as he could have), but his megalomaniacal corporate tycoon comes off too similar to Tyrell of the first film, even down to his classic film style accentuation of certain words and speaking patterns. Everyone else doesn't leave that much of an impression, and sadly that's the biggest problem that I had with this one. When it comes to the characters, nobody is really interesting or worth watching. There is an emotional level that the film is seriously lacking in and it can lead a lot of scenes feeling like they hang in limbo or last for too long. For me, this brought down the film tremendously. Which leads to the pacing of the film itself. The film is a bit shy of 3 hours long and isn't fast moving by any stretch of the imagination. I didn't find an issue with the pacing, as I felt it gave time for the film to breathe, find it's rhythm, and let the audience soak in the atmosphere. I may have had issues with the characters, but a lot of the quiet moments achieved a genuine transcendental quality that I found seriously relaxing. If people find this pacing to be that painful, they need to start paying attention to more heavy films. This is one gorgeous looking, technically brilliant piece of mainstream filmmaking that will never fail to be fascinating or awe inspiring, but IMO the lack of any fascinating characters keeps me from loving it like a lot of you folks. It can hardly be considered a bad film, but for me it is a great looking but decent in everything else recent film that doesn't hit the x-factor of it's ancestor.